The sînekemani ("breast fiddle") is one of the members of the viol family, which was very popular in Western Europe, and known in almost all the countries of Europe by its Italian name, viola d'amore, meaning "love fiddle." It was most likely brought to Istanbul by European diplomats. Until its arrival, the single bowed instrument in Turkish classical music was the kemân (or kemânçe). 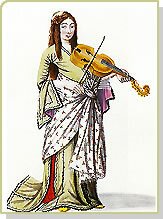 Because the viola d'amore was played resting against the breast, the Turks called it the sînekemani.